So you missed the last meeting, only to later learn that the “Downtown Committee” decided to name you to head up the city’s initiative to revitalize the downtown. Even better, a (insert any chain store here) recently announced their desire to build a new store on the main street, razing two older buildings. ˜ How do you proceed in the face of these development pressures? ˜ What are your and fellow residents’ future dreams for the downtown? ˜ Does this new development fit? Fortunately for you, the city just finished a visioning process which engaged residents in discovering the shared, long-term hopes for their community. Your committee will use this vision to help guide development and revitalization in your downtown. So, what is community visioning? 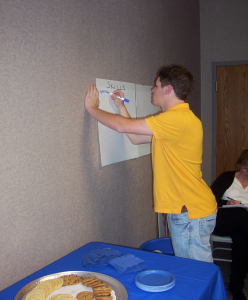 West Carrollton, Ohio – Volunteer Facilitator – Gathering input during Vision Session. 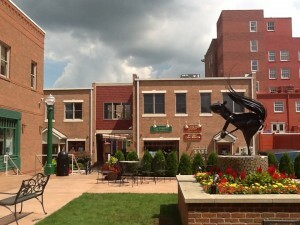 Kent, Ohio – Downtown, Acorn Alley – Places to gather. Locally owned small business. Arts and culture. 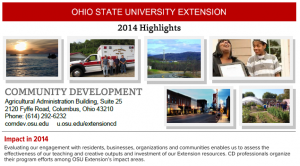 Over the past 15 years, OSU Extension’s Sustainable Initiatives has helped 11 communities (including cities, counties, townships and villages) throughout Ohio discover their residents’ shared vision. This process has often been the first stage in a comprehensive community planning process. Communities have found that their planning goals, when guided by a shared community vision, are more quickly and successfully achieved. For further information about community visioning and sustainable planning, visit the OSU Extension Community Development Sustainable Development website. Accessible and affordable healthful foods are a critical first step in good nutrition. To help make locally produced foods available to underserved communities in Cuyahoga County, a “Double Value Produce Perks” (Produce Perks) initiative was developed by the Cleveland-Cuyahoga County Food Policy Coalition. The coalition, initiated by OSU Extension and Case Western Reserve University, sponsored a program that offered incentive dollars to customers that used an Ohio Direction Card to purchase food. A customer wishing to use their food assistance benefits could swipe their Ohio Direction Card at a central terminal, located at any of the 20 participating locations’ information booths, and ask to withdraw a desired amount. 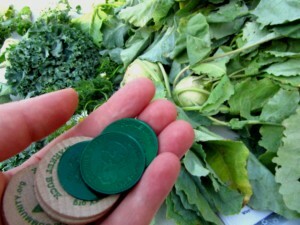 The market or farm stand would then provide tokens for the transaction in addition to Produce Perks that could be spent on fruits and vegetables. The incentive was a dollar-for-dollar match on every dollar spent (up to $10) using an Ohio Direction Card. The Double Value Produce Perks EBT Incentive program grew to 20 farmers’ markets and farm stands. One hundred eighty women and their families redeemed $3,920 in vouchers, enabling them to purchase fresh fruits and vegetables. EBT sales surpassed 2013 totals, reaching over $39,000. Additionally, Produce Perks brought 260 new food assistance customers to farmers’ markets for the first time. A new aspect of Produce Perks, the Produce Prescription program, was expanded to connect mothers and pregnant women to local farmers’ markets. For more information on this program or to learn more about initiating a local food policy coalition, please contact Nico Boyd or go to cccfoodpolicy.org/. Extension’s Community Development programs aim to engage people in strengthening their organizations, communities and ultimately social, economic, civic and environmental conditions to improve the quality of life in Ohio. A sampling of these efforts is captured in the recently published 2014 Highlights. We hope these highlights help you better understand how Extension-CD professionals partner to strengthen lives and communities through research-based educational programming and encourage you to contact us if you are aware of additional opportunities to partner or have specific questions about the efforts described. Extension Community Development . . .
What do you get when you partner with Extension CD?